I cannot sign in to my Skype account using S0-10. Is S0-10 only capable of Chinese and English displays? Does it also display in other languages? I have contacts in many different countries. Won’t this cause some problems with contact information? The S0-10 Skype Contact List supports displays in many different languages for your contacts from all around the world, whether it is in Traditional or Simplified Chinese, English, Japanese, Korean, French, Spanish, etc. In these cases, the names of your contacts will be displayed correctly. In addition, S0-10 supports the display of special characters and symbols. The ringtone is not audible. Active Mute: if a slashed musical tone icon appears on the screen, your phone is in the active mute state (i.e. no ringtones). To disable it, press and hold the # key. Call alert setting: go to Menu > Settings > Tones > Call alert and make sure it is not Off. Ring volume setting: go to Menu > Settings > Tones > Ring volume and make sure it is not 0. The network connection might be problematic. To check, try pinging your Internet Service Provider (ISP) or a generic web address to see the amount of delay in the network. Open the Command Window from Start menu > All Programs > Accessories. Type in "ping <ISP address or website> -t" and you'll see the response time streamed in real time. (For example, to ping www.yahoo.com, type in "ping yahoo.com -t"). The amount of delay should not go beyond 100~200 ms in order to have a smooth conversation over the web. If it does, we recommend that you contact your ISP. The status LED keeps blinking. Green, blinking: one of the Skype subsriptions is about to expire. Log in to your Skype account at www.skype.com to renew or cancel your subscription, and then the LED will stop blinking and the color will go back to blue (normal). When I tried to update the firmware, S0-10 says it already has the latest version. Not true! S0-10 displays the 'already updated' message if it does not recognize the new firmware files on your USB flash drive. Format the USB flash in FAT32, not NTSF or FAT. Save the firmware files in the root directory of the USB flash drive. Connect the USB flash drive directly to S0-10. Make sure the USB connector of the flash drive is enclosed with a metal chassis. Make sure the firmware language and hardware language match. Please reset your S0-10 to double check the hardware language. Go to Menu > General Settings > Reset. If English is the default language, please download the English version. If Chinese is the default, it means that the phone has the Chinese hardware, and you will need to use the Chinese version. You can switch the language back to English afterwards. I hear static on S0-10. Missed calls are not displayed. Can I transfer calls that come in to my phone to S0-10? You can transfer calls to your S0-10 in the following way. Purchase a SkypeIn online number at www.skype.com. A SkypeIn number allows anybody to call your Skype account using real numbers. Make sure the SkypeIn number is associated with your Skype account used in your S0-10. Configure your phone to transfer incoming calls to that SkypeIn number. Sign in to your S0-10 using the account including that SkypeIn number. Calls to your phone will be transferred to your S0-10. Can I extend the handset cord length? 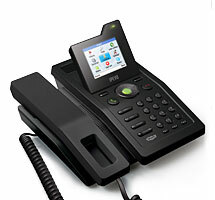 The standard handset uses an RJ11 connector to connect with the main body. Please note that we do not supply or promote the usage of an alternate handset or extended handset, and we cannot offer technical support for any such handset. You may try a telephone cable extender at a local Radioshack, but we cannot guarantee its effectiveness. What functions are not supported by S0-10? I use PPPoE to connect with the Internet. How do I configure connections with S0-10? Upgrade S0-10's firmware to version 1.4.152 or later. Does S0-10 support multiple Skype accounts? You can only log into S0-10 with one Skype account at a time. In order to use multiple accounts, you must log out and sign in with a different account. Can I store my Skype login password? When you log into Skype for the first time on your S0-10, you will be asked to enable automatic sign-in. Select yes, then your password will be stored and you will be logged in automatically for the next time. The screen freezes when switched on. Your S0-10 needs to be repaired. Follow this link for information on the product exchange process and our warranty policy. Can I use S0-10 in other countries? Yes, you can use S0-10 in any country. Why do I need to enter the date each time I turn it on? Please upgrade the firmware to version 1.4.152 or later to solve this problem. Where is the call history to my SkypeIn number? S0-10 does not show missed calls to your SkypeIn number (The WiFi Phone S0-20 does). Please go to www.skype.com and log in to your account to view the call history. Does S0-10 support a call-forwarding feature? Yes. The call-forwarding feature allows incoming calls to be transferred to a number of your choice when you are offline on Skype, or if the call is not answered within 15 seconds. Go to Menu > Settings > Call Divert > Call Forwarding. Enter the number you want the incoming call to be forwarded to. Please note that taking a forwarded call will use up your Skype credits according to the relevant rate. How do you select the ring tone and adjust its volume? From the main menu on your S0-10 screen, go to Settings > Tones > Ring Tone to set the ring tone style and adjust the volume. Why does the sound volume increase or decrease intermittently? Please check that the quality of your external Internet connection is consistent and stable, or whether any other programs (e.g. IM software) or other computers are also sharing or using the available bandwidth. If you are sharing your network (via a switch or hub, for example), we also recommend trying to connect the S0-10 directly to your network access point or modem, as this may drastically improve the quality of the calls. What kind of network connection does the S0-10 support? The S0-10 currently supports DHCP mode / Static IP mode / PPPoE Discovery mode. We suggest you obtain the details from your Internet Service Provider if you are unsure which kind of network connection you currently have. First try if resetting the phone/router/modem makes any difference. Log in 3 minutes after the reset. Make sure all entered information is correct. If you are using Static IP mode, make sure the specified information such as IP address does not cause any conflict with other devices on your network.